This Dan Dan Noodle Soup is a flavour explosion in a bowl, healthy (< 300 cal) and you’ll have it on the table in just over 10 minutes. The soup is thicker than the usual clear noodle soups, and the creamy colour is from the sesame paste (or tahini) and chilli paste. Traditionally it is made topped with stir fried pork, but today I’m sharing a meat free version which is my favourite way of making it – it’s faster and healthier. But just as tasty – a truly authentic flavour. A perfect midweek meal! A microplane is a handy thing to have in the kitchen for mincing garlic and ginger straight into the pot. If you use a young ginger with soft skin, you don’t even need to peel it. I never use a garlic crusher anymore, and I rarely bother finely chopping garlic, I just use my microplane. Undercook the noodles as they will continue to cook in the bowl when you ladle over the hot soup. I used rice stick noodles (pictured at the bottom of the post), but you can use any noodles you want. Unlike many noodle recipes, the noodles are actually cooked in the soup stock. Partly for the convenience, but also because the starch from the noodles actually thickens to stock which is how it is supposed to be. Make it as spicy or mild as you want. The authentic version is really spicy! 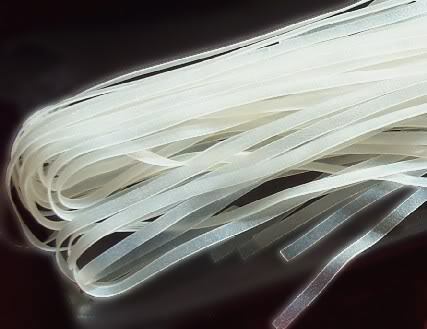 These are the noodles I used – rice stick noodles. 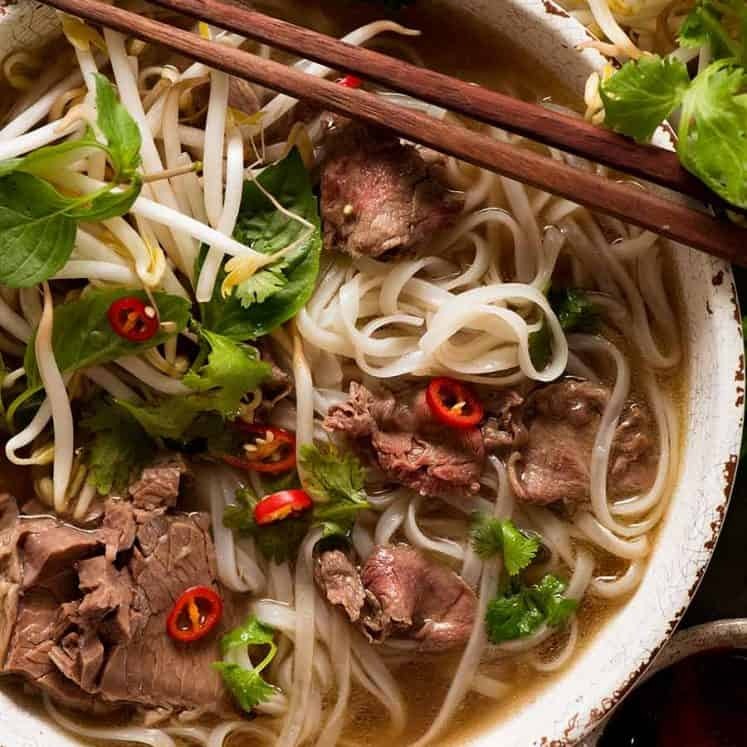 But this recipe is just as delicious made with egg or flour noodles, dried or fresh, except I wouldn’t recommend using vermicelli noodles as they are too thin for the punchy flavours of this soup. 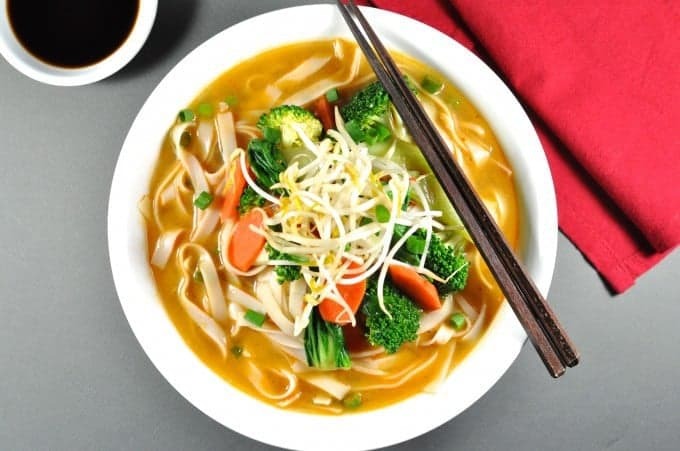 This Chinese noodle soup is a flavour explosion in a bowl, is <300 cal per serving and only takes just over 10 minutes to make. 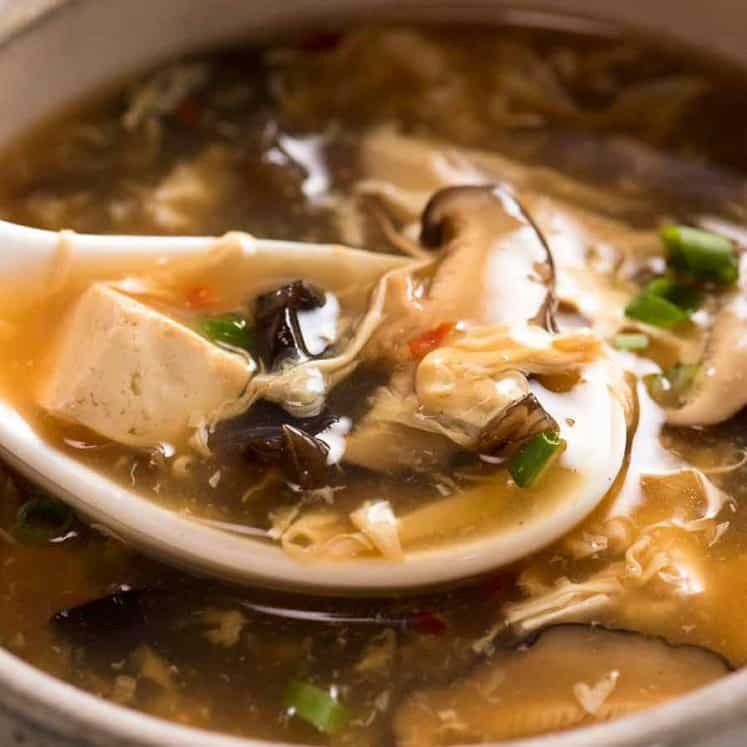 It is spicy, salty and slightly sour with the fragrance of sesame, with a thicker soup than the usual clear noodle soup stocks and I love the creamy colour and texture which comes from the sesame paste (or tahini), corn starch and the starch from cooking the noodles in the stock. Substitute the vegetables with whatever you have on hand and use whatever noodles you want. Meanwhile, mix the Stock Sauce ingredients together in a small bowl and cut all the vegetables into bite size pieces. Add the Stock Sauce and mix well to dissolve into the soup. Adjust seasoning as required. When the stock comes to a boil, place rice stick noodles in the stock, then 1 minute later add the carrots and broccoli, then 1 minute later remove from heat and add the bok choy stems. 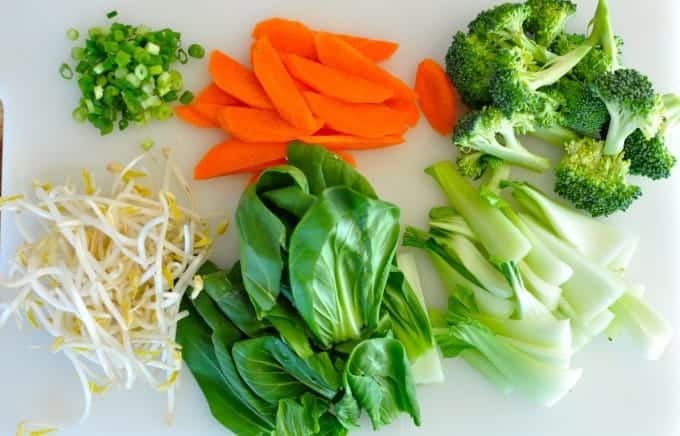 Divide the noodles and vegetables between bowls, top with the bok choy leaves and bean sprouts. 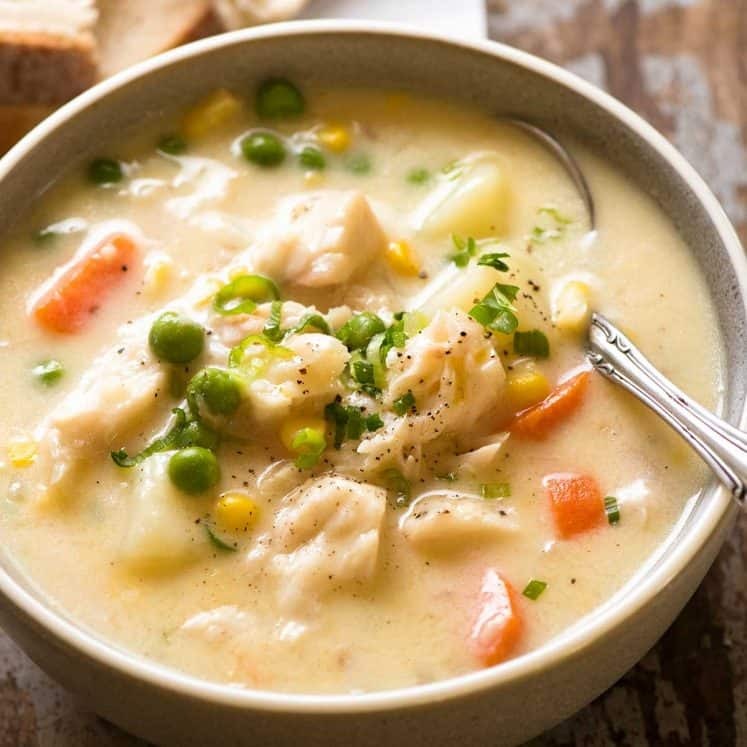 Ladle soup into bowls over the vegetables and noodles, and garnish with spring onions. Optional: finish with chilli oil and more chilli paste - if you can handle the heat! 1. You can really use whatever noodles you want, fresh or dried, rice, flour or egg noodles, just cook according to the packet instructions and remember to reduce the cooking time by a minute or two because noodles cook so quickly and they will continue to cook in the bowl. 2. If you don't have black vinegar, you can substitute for another dark vinegar, such as cider, but not balsamic. As a last resort, use 2 tsp white vinegar. 3. You can use whatever vegetables you want to, and pile them on! 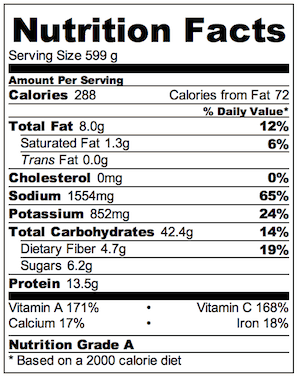 Other suggestions include: chinese broccoli, pak choy, red bell pepper, or even zucchini and spinach. I literally use whatever vegetables I have on hand for this recipe, that's what I love about it! 4. This soup keeps really well for 2 days, just separate the soup from the noodles and vegetables. Awesome recipe, thank you. I made it and will make it again! So flexible and fast.